What if environmental policy was based on minimum standards of environmental justice - Thou Shall Not Cause Thy Neighbor Cancer! Submitted by Norm Roulet on Fri, 08/27/2010 - 07:30. A few days after attending the EPA public hearing regarding the renewal of the license for Medical Center Company to continue burning coal in University Circle - which was OPPOSED by representatives of the Sierra Club, Environmental Health Watch, Earth Day Coalition, Women Speak Out For Peace and Justice, and all citizens who testified - I met with Neil Carman, Ph.D., the Clean Air Director of the Lone Star Chapter of the Sierra Club, in Austin, Texas, to discuss real NEO air pollution issues, the MCCO licensing situation, and next steps for improving the environment in Northeast Ohio. The oldest and largest environmental organization in the world, the Sierra Club is helping Northeast Ohio move away from coal, and they called for the EPA to hold the hearing challenging MCCO's license to continue burning coal in central Cleveland. Neil was recommended to me, by the national headquarters of the Sierra Club, as the go-to-person for legal concerns regarding local and federal EPA effectiveness. Neil is a former EPA investigator who now works for the Texas Sierra Club to bring government and legal action against major violators of the Clean Air Act. Neil has been instrumental bringing Federal EPA action to improve environmental enforcement and so air quality in Texas, and I sought his opinion on what action is needed to improve the environment in our region of Ohio. The primary reason I visited Neil was for his expertise with air pollution monitoring, from his many years working for, with and against the EPA. As I have documented on realNEO, the air pollution monitoring in Northeast Ohio is ineffective, and the EPA acknowledges our monitoring has been flawed since at least 2003. I asked Neil if he could suggest any explanations for the falure of our pollution monitoring here, and for his opinion on reasonable air pollution concerns in Northeast Ohio, based on scientific reasoning and what data is available. I showed Neil photographs of the Craig air pollution monitoring station in Cleveland and Neil seemed to consider the equipment up-to-date and appropriate. He was not in a position to comment on the specific devices, brands or technologies in use, but he believed we seem equipped to have viable air quality monitoring data from this station, which should be largely automated and accurate at all times. We did not review any information on any other monitoring stations in the region, but all of them seem to have frequent or fatal technical difficulties. I asked if there were imaginable technical reasons why our air pollution monitoring equipment and so data should be consistently wrong - to go off-line, from hour to hour, and day to day, for many years - and he could not offer an explanation. Neil suggested contacting the equipment manufacturers for data on their equipment and various installations - I have requested information on the equipment vendors and performance from Senator Sherrod Brown's staff and the Cleveland Department of Health, which is contracted by the EPA to operate the equipment. Modern air pollution monitoring equipment is designed to work accurately, over long periods of time, in remote sites with severe conditions, with little human intervention... self-calibration, and data reporting technologies are certainly capable of streaming real-time information to the public, in real-time, as demonstrated by global financial and weather information services. There is no reason why EPA air pollution monitoring data should be flawed for long, if ever. Neil was kind enough to spend several hours reviewing with me the air pollution situation in Northeast Ohio. We viewed dozens of photographs I took to Austin for Neil's review of smog in Cleveland, and major pollution point sources like Mittal and refineries here. We also checked the real time air pollution monitoring from the Northeast Ohio Areawide Coordinating Agency, which provides Northeast Ohio EPA data to the public, and the AirNow monitoring of Northeast Ohio, from the federal EPA. At the time we checked the air pollution monitoring for Northeast Ohio, it was clearly ineffective... and the EPA acknowledges air pollution monitoring in the region has been flawed for most or all of the 21st century. We also referred to the on-line Toxic Release Inventory data for Cuyahoga County, provided by the EPA. 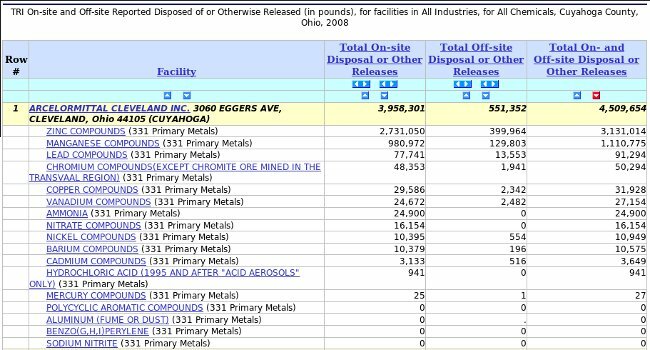 Cuyahoga County has over 160 significant, EPA-monitored toxic release point sources in the EPA TRI database - we are the 79th highest volume toxic release county in America - and our air pollution monitoring is ineffective and clearly has been ineffective for a very long time... may we be worse? The worst polluter in the TRI database for the County is certainly Mittal. Science is clear the air pollution from combination steel mills like Mittal - and so Mittal - is harmful to humans. I showed Neil dozens of photographs of the various Mittal facilities and operations in Cleveland, showing pollution from point sources and fugitive emissions, and Neil had no doubt that Mittal emissions are a major pollution contributor to Northeast Ohio and the world that impacts the public health of millions. Neil reviewed the TRI data for Mittal and concluded the levels of metals alone emitted by Mittal are harmful to the health of area citizens. Regarding the issue of the Medical Center Company licensing to burn coal in the heavily populated community of University Circle, in urban Cleveland, central to a region of over 2 million people... Neil had no doubt this is a controversial issue, but concluded they must stop burning coal there. We discussed climate, topography, soot levels and health impacts in the surrounding neighborhoods, which include my neighborhood of East Cleveland, and concluded it is not safe to burn coal in any such densely populated communities... and emissions from coal burning at the MCCO plant are harmful to neighbors. Neil was especially concerned MCCO has operated without a license since 1998 - as surfaced during the recent EPA licensing hearing for MCCO, and raised as an issue in Earth Day Coalition director Chris Trepal's testimony against MCCO licensing. Neil suggested a lawsuit against MCCO is in order. I believe Neil said fines for operating a powerplant without a license are over $37,000 per day, meaning fines for MCCO would be over $13 million per year, if correct. No matter what, fines for MCCO operating without a license should be considerable. Neil suggested MCCO isn't the only polluter in Northeast Ohio that may need to be sued for violations of environmental laws, and he offered names of environmental attorneys who work with the Sierra Club on such matters and should be contacted to ask for support. I told Neil that is the work for more litigious-minded activists (if there are any out there who care about the health of Northeast Ohioans and the world)... I just want to understand the current state of our environmental science and what that means to my family, and community. To put the question simply, I asked Neil if he would raise children in Cleveland, so near a combination steel mill, in a region with so many pollution point sources, where there is an overzealous commitment to burning coal and supporting "industry" at any cost, where the air pollution monitoring has been ineffective for so long, and the local environmental protection agency appears so ineffective in general, and Neil said he would not - he advised me to move my family away from Cleveland. Without effective pollution monitoring and environmental regulation here, it is impossible to say where is safe to live in the region, so the entire region must be considered unsafe. And, reviewing the EPA TRI database for the all counties in Northeast Ohio surfaces many significant point source polluters throughout the region... most disturbing being coal burning powerplants, landfill and recycling facilities, and plants in the metal processing industry... that spew 100,000,000s of pounds of pollution into the air we breathe each year, and we are not adequately informed of their pollution levels and the harm caused to surrounding humans. Neil certainly does not want to be involved in our environmental politics - Northeast Ohio leadership is largely Democratic, so their failure taints the Obama administration. I have raised the issue of poor environmental monitoring and regulation here - and concerns about poor leadership and political corruption in Northeast Ohio - to the attention of the National Democratic Party and the White House, to prevent our environmental crisis in Ohio from becoming a liability to the President. He is now aware of our health issues here, and may address our problems. If he fails to now address public harm from pollution here, he deserves to address our public health consequences as HIS crisis, as that is avoidable today. Coal and its impact on the environment are hot issues for Democrats and Republicans alike. Obama already has a clean coal crisis escalating in his home state of Illinois... he doesn't need to mine for more coal disasters in Ohio. But, that is clearly what he has on hand, as science further illustrates the harm pollution from burning coal causes here... and the Obama administration energy policy vision for the next decade still includes trying to scrub the dirt out of the coal industry, which is impossible. Of course, the people who profit from all this pollution are Democrats and Republicans alike. As such, no politicians here or out-of-state want to discuss harm from coal burning by MCCO, or their licensing issues, or the connection of Sherrod Brown's brother to all that, or that our air pollution monitoring is broken, or that our air pollution levels seem dangerously high, or that all this is largely the fault of government leadership, employees and contractors here, even if all true, and the responsibility is shared by Democrats and Republicans... from the top to the bottom of the mineshafts. Because Democrats are in charge of Ohio and America right now, as climate science is maturing and nearing public acceptance - and the public is learning how serious a crisis we face in places like Cleveland and worldwide - Democrats stand to be blamed for harm that has been long-coming, but just now enters contemporary enlightenment. As a result of excessive pollution from BP, Obama is now distrusted over off-shore drilling. His administration approved environmental policy that immediately proved disastrous. The realities of that Obama administration misdirection are introduced in "Anatomy of a bad decision: Obama’s embrace of offshore drilling was made by limiting scientific and environmental input" - "Now it’s clear that this poor decision looked amateurish because it was. The administration simply didn’t do his homework. The decision was made without full scientific and environmental input — by design." I wrote letters to national leaders and visited more than half a dozen nations... What I found in each case was greenwash – a pretense of concern about climate but policies dictated by fossil fuel special interests. Because the executive and legislative branches of our governments turn a deaf ear to the science, the judicial branch may provide the best opportunity to redress the situation. Our governments have a fiduciary responsibility to protect the rights of young people and future generations. In conclusion to my meeting with Neil about environmental concerns in Northeast Ohio, Neil was vocal he is very supportive of the Obama administration's appointee for director of the EPA, Lisa Jackson, and he believes there has been significant progress with the EPA under her leadership - he certainly believes things are improving with the EPA, environmentalism and climate policy in America since the transition from the Bush administration, and that it is important we do not lose that progress with a change of administrations at the White House and the EPA - they need time to implement the policies that will ultimately save the planet. The concern that conclusion leaves in my mind, which no politicians or environmentalists want to discuss, is that it is very easy to sit in the clean, green cities of Austin, San Francisco, or Boulder and speak of caps and trades to sustainable global energy policy for all, as your kids breath fresh, clean air, but what do you say to the people of excessively polluted places like Northeast Ohio, where too high of percentages of children have asthma... adults have too much cancer... and that is because we are the unfortunate ones who live near the worst pollution point sources, and environmental policy from on high is only concerned with the "greater good", as viewed from a Boulder in beautiful Colorado. Sitting by a steel mill in a sweltering industrial valley where there should not be such industry, in times of climate change, I see environmentalism very differently than even the most radical environmentalists... I see environmentalism as a cause of my environmental injustice, in the excessively polluted region of Northeast Ohio. What if environmental policy was based on minimum standards of human health, decency and environmental justice? What if we added to the Golden Rule Thou Shall Not Cause Thy Neighbor Cancer? What if environmental policy began by dealing with child-specific needs and rights - in the best interests of the child - like Thou Shall Not Cause Thy Children Asthma? . Thus, what if we denied licenses to polluters that violate the United Nations Convention on the Rights of the Child, as suggested by Vicky Knight, representing Women Speak Out For Peace and Justice, in her testimony against the license for MCCO to continue burning coal in University Circle, Cleveland, Ohio. That would certainly change the rights of Mittal and MCCO, with one solid global convention for a better world for all, from the mountain tops to the Flats. The only way the people of Cleveland shall gain the rights for their children offered by the United Nations Convention on the Rights of the Child is to fight for that. I can tell you, having lived in many beautiful places full of beautiful environmentalists, and having recently discussed these global concerns with environmental policy leadership directly, I'm sure our safe, healthy global policy leadership doesn't lose sleep over whether the pollution monitoring works, and citizens are being polluted, in excessively polluted places like Cleveland. Such source point concerns like in Northeast Ohio are for the citizens of Cleveland to lose sleep over, fight, or die. I've lost enough sleep and learned enough horrific realities just documenting and analyzing the facts of this situation to want to die, and now I must decide how to process the advice I have received to move my family away from my home, because it is too unhealthy here. I'd like to believe local leaders - politicians - citizens - would share my concern it is unhealthy to live here, and would join with me to demand changes to environmental policy here, but there is no reason to believe that will be the case. Public and private response to my documentation of our pollution crisis on realNEO, and NEO-wide, has been hateful, at best - harmful to my family, at worst. Global response to our crisis is better outside Cleveland. It is clear there are people outside Northeast Ohio, like Neil Carman and Lisa Jackson, who care about the environment and public health in Cleveland far more than do typical Clevelanders... and good people are working around the world to make Cleveland safer for citizens here and worldwide. The question I must now ask myself, for my family, is may I have more impact as an activist for environmental justice in Cleveland by leaving Cleveland, and working from the outside, or by staying here and escalating local battles against citizens and leaders here who fail to take public health seriously, and cause my family harm. Is it worth hurting my family, and being hated, for this PLACE and the people here who in fact seem generally unappreciative of environmentalism in the first place? Does this PLACE deserve to steal any more years of life from my children, who are less healthy as a result of having lived here, for STEEL?